COSHARP is an acronym for Continuous Optical, Slit, High-Speed, Anamorphic Reduction Printer. The COSHARP Printer concept was originally proposed to the Technology Council by Richard Edlund of Boss Film who felt that this 'missing link' would enable high quality 65mm film to be used for original photography of theatrical films. During the past half a dozen years there have been major breakthroughs in the availability of modern 65mm cameras, lenses and film stocks. These new tools have eliminated most creative and financial limitations related to producing film in 65mm format. Still there remains a missing link - the need to reduce time and costs and improve quality during post-production. The COSHARP printer, which is designed to reduce the cost and simplify the process of making daily and editorial work prints from 65mm camera originals, achieves that goal at a cost not significantly greater than that from 35mm originals. After validating this concept, the Technology Council arranged for financing and oversight of the printer construction in order to develop this important cost-effective Project for the benefit of the industry as a whole. Their technological approach to the COSHARP concept was presented at the SMPTE 1991 Technical Conference in Los Angeles, and published in the SMPTE Journal, September 1992 (pp.618-621) in a paper entitled "The COSHARP Printer - Design Concept" by John Mosely. Currently, the printer is located at CFI's Laboratory in Hollywood, where it has been certified for use under laboratory conditions. Special thanks are due to John Baptista, Frank Alba of CFI and Trent Hilton at Deluxe Laboratories for innumerable hours of testing and alignment of the printer at CFI. John Mosely, the TCMPT Project Engineer, worked together with T/R Toolmakers on the basic mechanical construction of the printer. Mark West refined the prototype sprocket and lens housing design, and BHP fabricated the sprocket. 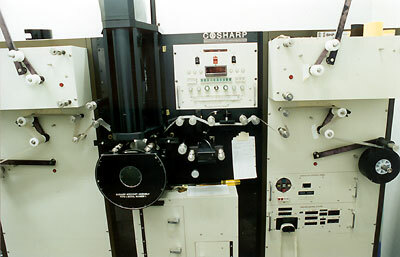 Among the unique features of the COSHARP printer beside proven BHP feed and take-up components, is a custom-designed optical anamorphic reduction train, and the locked-together 65mm and 35mm sprockets. A fiber optic device reads the 65mm edge codes and transfers this data to the 35mm side. David Grafton, designer of the lens notes that bench tests show this to be essentially defraction limited and devoid of centration, measuring on the bench 180 lp/mm horizontally and 250 lp/mm vertically. The theoretical maximum resolution for a lens of this type is 250 line pairs per millimeter! After completion it was noted by the designer that it was the best lens he had ever seen. Richard Edlund points out that the COSHARP optical system is designed to be telecentric. That is, it has an increased depth of focus with a flat and evenly illuminated field so that the image does not change size with changes in focus. COSHARP, therefore, provides what was missing and allows for the return of filming in 65mm, regardless of the intended release format. It can also be used for making timed answer prints, and optically reduced interpositives, saving significant sums of money in production. Running at 200 feet per minute COSHARP runs up to ten times faster than a step printer with utmost safety for the valuable negative. That is, the COSHARP printer runs in a continuous motion, which considerably reduces the risk of damage to the original negative. 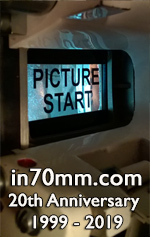 By comparison, the typical stop and go motion of a step reduction printer, which runs at between 15 and 20 feet per minute, creates stress and wear on the film sprocket holes, not only contributing significant wear to the film, but is cumbersome and costly. Clearly, the COSHARP printer removes a major barrier to 65mm production by quickly producing super-quality 35mm prints for dailies and postproduction. It is an economic and technically acceptable solution to all of the problems outlined above, not only speeding up production schedules at significantly less risk of damage to the camera-original negative, but also by substantially reducing laboratory costs. In addition, a 35mm print from a 65mm original negative looks better than a 35mm print made from a 35mm original. For this reason Richard Edlund anticipates that Directors of Photography will achieve better results shooting in 65mm even if they only intend to release in 35mm. Certainly COSHARP will turn out to be a valuable and cost effective device for the motion picture industry, representing a significant step forward in producing large-format productions like “Lawrence of Arabia”, “Sound of Music”, “Oklahoma!” and other classics, more recently exemplified in Vittorio Storraro's “Little Buddha”, filmed partly in 65mm. It is hoped that we will soon find screens filled with similar 65mm productions that have an exemplary effect and impact on the audience.